In the Spring of 2013 a 78-card, hand-painted tarot deck created c.1906 by the mystic and artist Austin Osman Spare, was identified within the collections of The Magic Circle Museum in London. Austin Spare’s life-long interest in cartomancy is well documented, yet very few of his own fortune-telling cards were thought to have survived. This compelling new example of the artist’s early work demonstrates his precocious involvement with the currents that shaped the British Occult Revival at the beginning of 20th century, and his interactions with some of the period’s lesser-known protagonists. Magic Circle Museum curator and artist Jonathan Allen immediately recognised that Spare’s cards were not only art-historically significant, but also entirely unknown outside of The Magic Circle’s collections, and set about tracing the deck’s provenance, its place in the artist’s oeuvre and within the wider histories of cartomancy. 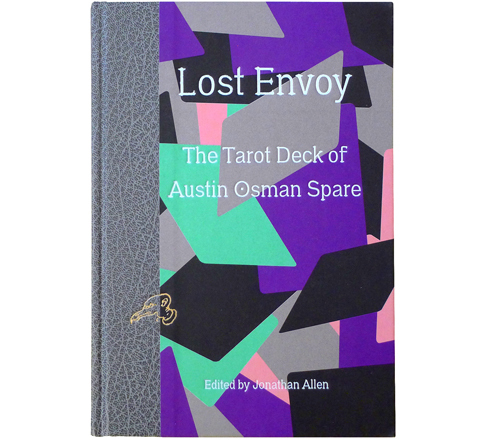 Lost Envoy reproduces Austin Spare’s tarot deck in its entirety for the first time, alongside new written and visual contributions from Jonathan Allen, Phil Baker, Helen Farley, Alan Moore, Kevin O’Neill, Sally O’Reilly and Gavin Semple. Published by Strange Attractor Press in association with The Magic Circle, and supported by Arts Council England. Designed by Fraser Muggeridge Studios, London. "Just as each new dealing of divination cards appears to reveal previously untold insights, so this volume and the tarot deck it commemorates is likely to continue opening new doors onto many aspects of art, literature and cultural history – as well as those shadowlands where magic and occultism meet and conspire." Brian Sibley, The Magic Circular. "There are, of course, hundreds of new Tarot decks available today and every artist or designer has something to say about why their deck is different and special. So why is Spare’s deck worth our attention? Each of the contributors to Lost Envoy answers this question […] While Spare’s creative isolation and failure to publish his deck does mean that its influence has been virtually non-existent, Lost Envoy heralds the end of its obscurity and the real beginning of its influence on cartomancy and cartomancy decks."